Foreign direct investment (FDI) in Indonesia from January to March rose by 27.7 per cent to about $6.744 billion on a yearly basis, officials said in Jakarta on Monday. The total of foreign and domestic investment in the first three months increased by 30.6 per cent to 93 trillion rupiah, Chatib Basri, chairman of Indonesian Investment Cordianting Board (BKPM), told a press conference. Indonesia regained its credit rating upgrade to investment grade recently from Moody’s and Fitch, helping luring global funds managers to put their funds in Indonesia. The China-led Regional Comprehensive Economic Partnership talks are expected next month. ASEAN is scheduled to have talks on the RCEP with Australia, China, India, Japan, South Korea and New Zealand in May. This partnership will create a economic bloc of more than 3 billion people with a combined economic output of $17.23 trillion by 2015. In addition, Indonesia hopes to conclude a comprehensive partnership agreement (CEPA) with South Korea to help boost two-way trade to $100 billion by 2020 by the end of the year. Growing investment and huge domestic consumption have countered the decline in Indonesia’s exports that spurred the economy to expand by more than 6 per cent since 2010. 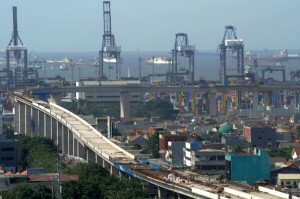 Indonesia’s economy is expected to grow by up to 6.8 per cent this year and 6.4 to 6.9 per cent next year.